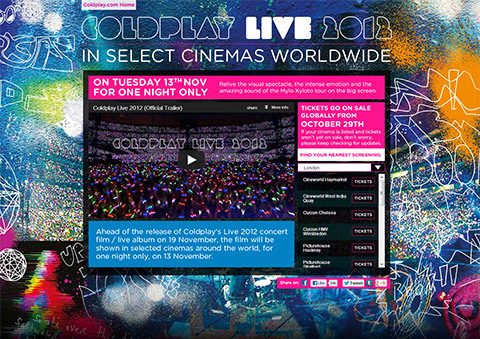 A destination for fans all over the world wanting to find their nearest screening and book tickets to see Coldplay Live 2012 on the big screen. On November 13 Arts Alliance Media (AAM) released Coldplay Live 2012 on select screens in over fifty countries around the world. The band’s first concert film/live album for nine years, it documents their acclaimed Mylo Xyloto world tour, which has been seen by more than three million people since it began in June 2011. Glass Eye worked with AAM to provide a destination for fans all over the world wanting to find their nearest screening and book tickets. The site proved hugely popular, generating over 10k Facebook Likes on the day of launch alone and providing an accessible, non-nonsense focal point for the one-off cinematic event. As ever, thanks to all involved in this one, especially the webmasters at EMI who helped make sure the in-site cinema listings were up-to-the-minute, round-the-clock. Watch this space in 2013, we’re hoping this is the first of many in the fast-turnaround, super-agile realm of digital distribution.